Wind the thread to a position opposite the barb. Catch in a bunch of Marabou and a couple of lengths of krystal flash (Optional). Trim the waste and secure down onto the shank with thread. Create a level body by running the thread to the eye and back down to the position opposite the barb again, finish with the thread at the middle position of the hook shank and whip finish. (Make sure the body does not get too thick). Wind some fine lead wire around the hookshank from the position opposite the barb to a position close to the eye. Make sure the lead wire is wound in even turns and no gaps are left between each turn. Trim the lead. 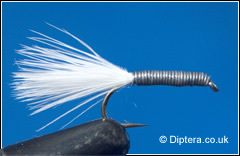 Cover the lead wire with a coat of brush on superglue, making sure not to come into contact with the marabou.